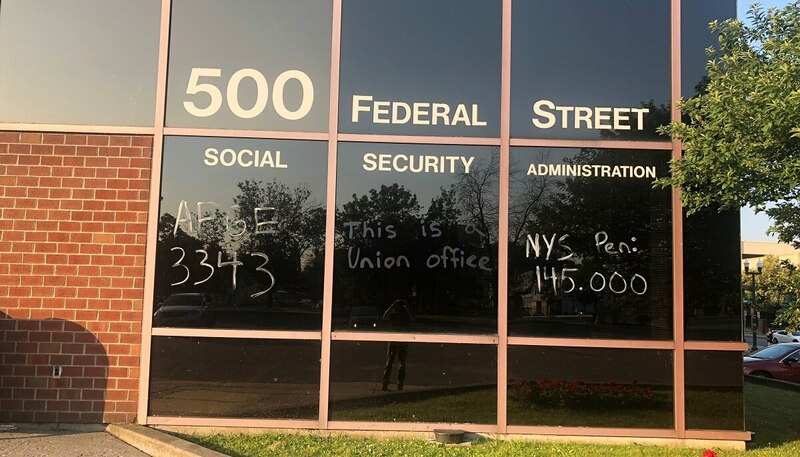 Late at night July 1, Pelletier wrote on the windows of the Troy, New York, SSA office building with washable window paint. Pelletier said it was an act of protest of moves the agency had made to remove the union from the offices. President Donald Trump in late May signed a series of executive orders that called for the eviction of unions from government buildings and placed limitations on use of official time and union contract negotiations. 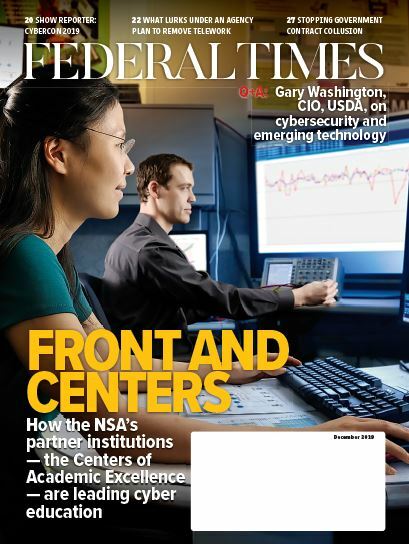 AFGE officials said that after a July 9 government deadline to begin enacting the orders, employees at agencies including SSA have experienced “chaos” in trying to cope with the changes. 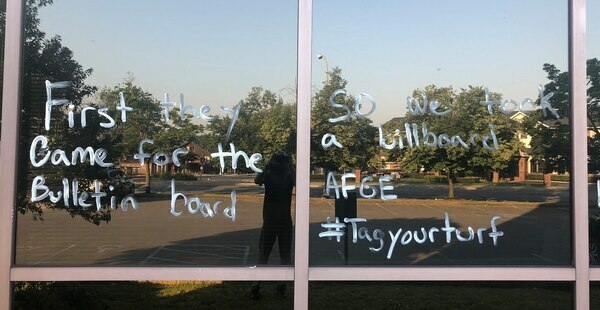 Pelletier said he was motivated to write on the office windows after he saw an SSA official measuring the bulletin board used for union information in anticipation of the union’s removal. Though Pelletier protested the request, his manager insisted that he would have to go on leave. Pelletier said he plans to file a grievance related to SSA’s violation of administrative leave limitations. Dwight Jenkins, a fellow claims representative in the Troy office, went into the office with Pelletier as a witness and note-taker. He confirmed that Pelletier was given neither a reason nor a timeline for his placement on administrative leave. According to Pelletier, he has not received a single piece of written documentation about the administrative leave. “They never told my why I was suspended, what I did. It’s pretty clear to me that it was related to the window thing. They have not told me not to do it again. And they have not asked me for the keys to my building,” said Pelletier. Jenkins said that the next day the access codes to the building were changed, a standard policy when an employee leaves SSA either permanently or for an extended period of time. Pelletier drove to a July 13 grievance presentation for an SSA employee he was representing as part of his union role and was only told at that time that he would not be allowed on SSA property or to meet with fellow employees in agency space. According to AFGE 3343 Local President Pedro “Pete” Aviles, there isn’t much the union can do about Pelletier’s case until agency leaders decide what they plan to do with him. Pelletier said that he is a bit disappointed that the national branch of the union has been largely uninvolved since his original conversation with them about his administrative leave placement. Aviles added that SSA Area Three Director Yolanda Peña-Benitez told him that they are awaiting police reports on the incident before issuing a decision. According to Jenkins, the agency generally hasn’t responded to incidents that happen on an employee’s own time. Both he and Pelletier have been arrested while attending political protests, and Jenkins said that he was applauded when he returned to the office afterward. But Aviles, Jenkins and Pelletier all said that there is a strong sense that the agency intends to issue him a removal notice in the near future. Pelletier noted that his actions exist in a gray space in terms of rule-breaking. New York State penal law defines graffiti as marking public or private property “with intent to damage such property.” Pelletier said he used a paint intended to be easily washed off windows. The building itself is not government-owned property, as the agency rents the space from a private owner. Pelletier said he has been unable to determine if his actions had any impact on the agency’s lease. But, according to Jenkins, the agency’s response to Pelletier’s actions has caused upheaval at the office. Aviles also said that Pelletier is seen as an “excellent employee” and isn’t perceived as a troublemaker. The office has since received a new district manager, who happened to be married to a current employee, for a six-month detail, therefore necessitating that the current employee be moved to another office. Both Jenkins and Pelletier said that these changes indicate that the orders are potentially coming from the regional commissioner in New York City. “The ripples from that — losing our manager, losing one of our beloved technical experts — the ripples are continuing to move outward and affect people,” said Jenkins. Both AFGE National and SSA said that they could not comment on personnel and investigation matters.